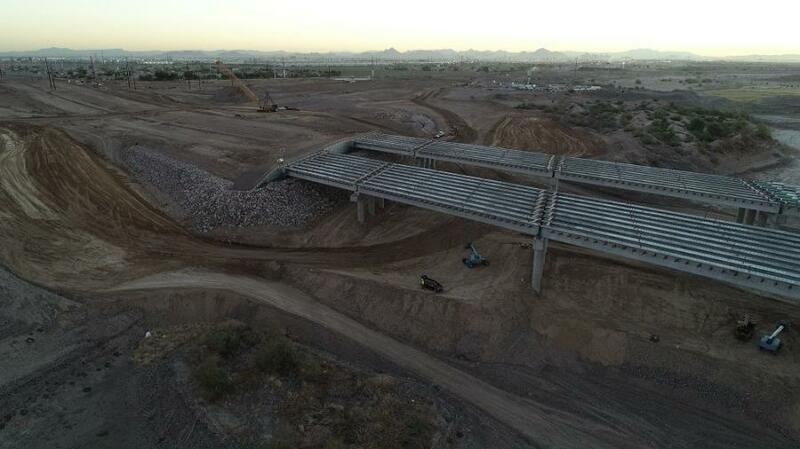 That's the number of concrete girders installed on two Loop 202 South Mountain Freeway bridges spanning the Salt River between Broadway Road and Southern Avenue in the southwest Valley. It's also nearly a third of the 1,000 girders to be installed on 40 bridges throughout the 22-mi. corridor, according to the Arizona Department of Transportation. 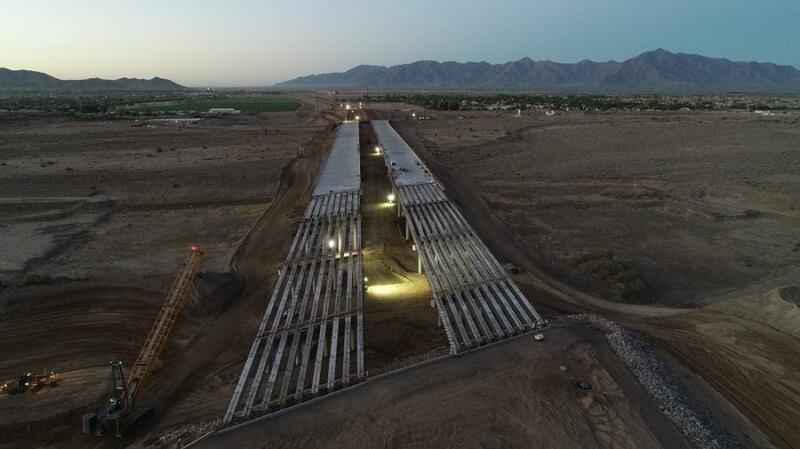 Working overnight, crews placed the final support beams for the half-mile-long northbound and southbound bridges that will carry traffic across the Salt River when the South Mountain Freeway opens as early as late 2019. Connect 202 Partners, developer of the South Mountain Freeway, placed the first girder at the Salt River on July 21, 2017. Many of the girders are very long and heavy, weighing 169,000 lbs. and extending 170 ft. in length. That's 9 ft. longer than any single-span girder ADOT has ever used for a bridge. All of the girders were manufactured locally and hauled to the construction site overnight, when traffic is lighter. Two large cranes carefully hoisted and set the girders atop the bridges' abutments and piers. Now that all girders have been installed, crews will finish pouring concrete decks and adding barrier walls on the bridges. Construction equipment is expected to be able to cross the bridges by early 2019. The freeway's Salt River bridges will provide a much-needed local crossing to and from Laveen, especially when the river flows, while also reducing congestion at current crossings. The city of Phoenix's 51st Avenue bridge is currently the lone all-weather Salt River crossing between 35th Avenue and Avondale Boulevard.